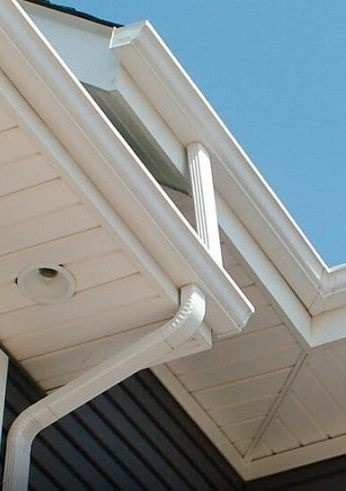 No home is complete without having a well-designed, sturdy built seamless gutter system. By collecting and carrying water safely away from the home, gutters protect the home in many ways. A replacement of aged gutters or an installation of new seamless gutters can prevent siding or window sill erosion, foundation problems, landscape washouts, undermined driveways, patios, and walkways, and even the home's structural integrity while adding beauty. Click on the photo below to zoom in on our gallery! Homeowners today have many more options for gutters than ever before. Team Vinyl and Roofing Co. is proud to install only the best in seamless aluminum and copper gutters, and leaf protection systems from the major manufacturers in the industry – Englert, Leaf Relief and Gutter Cap. All homes need rain gutters. The design and engineered 032-gauged aluminum seamless gutters are the strongest built system available on the market – also representing the best value for your money. Seamless aluminum gutters have a lower cost than copper, but still a high value addition to any home. • Available in 14 different base-line colors. • Aluminum gutters are very friendly on the homeowner's budget. So what exactly is a "seamless" gutter – and why are they better? As the name implies, seamless gutters eliminate the seams commonly found in sectional gutter systems. In a traditional, sectional gutter system (installed using pre-formed lengths of aluminum gutter), if the length of gutter needed exceeds the length of a pre-formed gutter section (which it usually does), multiple sections need to be hooked together until the full length is reached. Every time 2 sections are connected, a seam is created. This also creates another opportunity for leaks to form. In a seamless gutter system, this does not happen. Sure, there are still some joints, even in a seamless system (at each end for example), but by eliminating the seams within the length of the gutter run, the opportunities for leaks are also eliminated. 5″ K-Style gutters are the industry standard for residential installations. 5″ K-Style gutters can be seen on the vast majority of homes in the United States. The professionals at Team Vinyl and Roofing can custom-form your seamless 5″ aluminum gutters on-site to give you a flawless gutter system with a custom-crafted look, but at the budget-friendly cost that aluminum guttering is known for. Copper gutters remove gutter systems from the realm of utility and transform them into architectural features that are meant to be noticed. Copper gutters make a real statement as to how you think about your home and how you measure value. With each passing year, copper ages gracefully, developing a beautiful patina, yet it still retain its complete structural integrity so that it may outlast many of the homes on which it is fitted. In Europe there are many homes that still have copper guttering systems that were first fitted hundreds of years ago. The great thing about copper gutters is that they will never rust or rot. Copper is a metal that forms a natural renewable corrosion barrier, and it has the all the natural strength of metal to stand up to the elements better than any other material. Copper gutters may be more expensive initially but if you intend to build your home to last and if you or children will still be in the home in 10, 20 or 50 years then copper becomes a very smart investment. Once in place it will never need replacing. And don't forget about the added value to your house on a resale basis and you will see that, as with many decisions made on the basis of quality, the long-term benefits far outweigh the initial higher cost. Plus, Team Vinyl and roofing Co. installs Leaf Relief™ a unique system that uses water surface tension to prevent leaves and debris from entering your gutter troughs, but allows water to flow freely. The patented Leaf Relief ™ design is one of the few gutter protection systems that have been proven effective, and once it’s installed, cleaning your gutters will be a thing of the past! “They did a great job for us installing seamless gutters and ground drains. Their proposal/estimate was the most professional of all we received, they were fast, competent and courteous”. Call Today For Your Gutter Service Estimate! Once you’ve selected either aluminum or copper gutters for your home, our team of certified installers will mount them securely, and also install the appropriate size downspouts to keep water flowing freely year-round. Whether it is new roof installation, or replacement of aging gutters, you can count on Team Vinyl and roofing Co. to install quality Englert seamless gutters that will deliver many years of reliable service and value. Call us today to learn more or fill out our quick form to receive your FREE, no-obligation estimate. Cheshire County, New Hampshire, Including Winchester, Swanzey, Chesterfield, Keene, Westmoreland, Richmond, Fitzwilliam, Surry, Walpole, Alstead, and Spofford New Hampshire. Windham County, Vermont, Including Brattleboro, Vernon, Guilford, Dummerston, Newfane, Putney, Brookline, Westminster, Halifax, Marlboro, Bellows Falls, and Wilmington Vermont. Are you in or near one of the above locations, and your not seeing your city or town listed? Contact us today to see how we can help! Team Vinyl and Roofing Co.